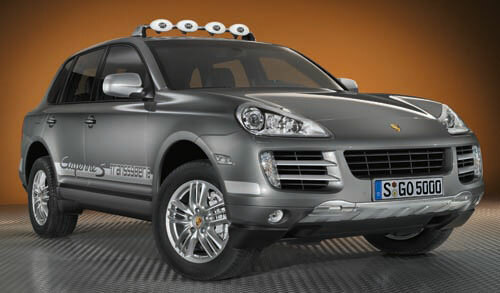 Porsche announced today that they will be unveiling a new Cayenne model at the Paris auto show this fall. Only 21 Canadian buyers will have a crack at the latest special edition of the highly popular Porsche Cayenne S, dubbed the Transsyberia, referring to the Moscow to Mongolia race that Porsche organizes and has won the last 3 times. Mechanically the SUV’s will be fitted with the 405 hp 4.8L V8 engines found in the Cayenne GTS as well as a 6 speed Tiptronic transmission. To balance ride quality and performance, look for an air suspension and Porsche Active Suspension Management (PASM), which electronically adjusts the shock absorbers for optimum balance. The permanent all-wheel drive Porsche Traction Management (PTM) system divides the torque between the front and rear, with a 62% rear-bias for greater on-road driving dynamics. To visually distinguish the Transsyberia, 4 unique combinations will be produced, Black or silver with orange accents, Silver with grey accents and Black with silver accents. Also included are optional roof mounted driving light, as long as you forgo the sunroof, just like the desert roving models Porsche outfitted for the 7,100 kilometre race. In addition to the 2 standard stainless steel skid plates under the vehicle, buyers can request a special off-road package that includes a variable and lockable rear differential, rock rails with integrated skid plates, a reinforced engine-bay guard and enhanced protection for the fuel tank and rear axle is available. A second towing lug is included to help extricate wayward drivers from embarrassing situations. Look for Cayenne S Transsyberias’ to be available in the spring of 2009 at a suggested list of C$87,200, however I imagine if you haven’t already spoken to your local dealer, you may be out of luck.